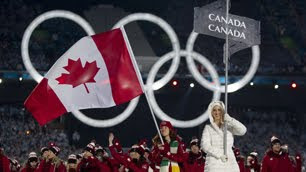 I had no intention of watching the opening ceremonies of the Vancouver 2010 Olympics. But the build-up in the hours leading up to the start of the program completely sucked me in and wouldn't let me go. I had fully intended to spend my evening learning scene three of A Number, the play we're doing at the end of February. But, learning lines will need to wait till morning. Prior to the selection of Vancouver as the site of the 2010 Winter Olympics, the Chair of the Bid Committee, John Furlong, was on a goodwill tour of the country stirring up support. He met with a small group of us in Fort McMurray, expressing fully at the time the recognition of the amount of work that would lie ahead if they got the games. Flash ahead eight years and there he was, now CEO of VANOC, speaking in front of a worldwide audience of hundreds of millions, perhaps several billion. Canada is seen as one of the greatest nations on earth, and as the camera scanned the enchanted faces of the athletes, you could see the appreciation and respect in their eyes. From the opening Aboriginal segment to the stirring "Who has seen the wind" prairie sequence, artistic expression -- music, theatre, dance -- elevated the senses and stirred the soul. We are Canadian, and we are proud. We were reminded of the humanity behind the games as the team from Georgia entered the stadium, solemn, reflective, pained beyond measure. Earlier today, a member of their luge team left the track and slammed into a steel column and was killed -- a practice run turned tragic. The 60,000 people in BC Place stadium stood in solidarity for one man, one country, one world.